If you want to use any of the meshes or textures I used in this mod, please check the credited files, if it belongs to them. You can use all assets I made in your own mod (that is not a translation or patch for this file), but you must give me a credit. All my meshes and textures are located in Meshes/DarthWayne or Textures/DarthWayne folders. If you want to use other assets used in this mod, please check the credited files. If you have questions about permissions just send me a pm. If armor or weapons of the guards are not loaded correctly, often a simple quicksave (f5) and reload (f9) will fix this issue. 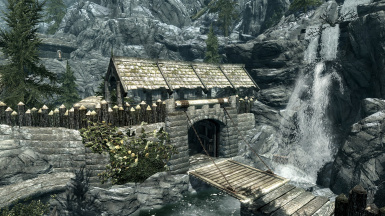 - renamed "Manager" to "Steward Balin"
- Replaced the stone bridge outside the Helgen gate with a drawbridge. - Added interior for miners house. - Removed underwater portcullis in the cavern that closed when lowering the drawbridge. 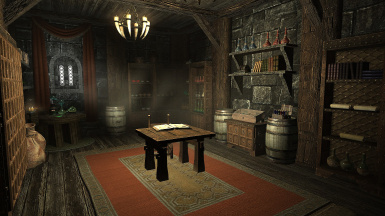 - Removed several stage requirements in the purchase quest, that can prevent the player from completing the quest. - Added missing script for triggering attacks with the alarm horn. 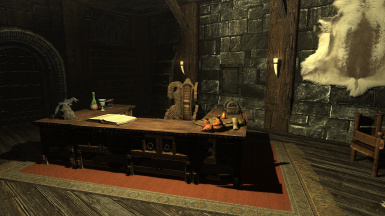 - Fixed a bug that caused the dialogue option for decorating the library to show up after it was already purchased. - Fixed a bug that caused the dialogue option for rebuilding the elite barracks to show up after it was already purchased. - Combined "Barracks" and "Elite Barracks" to one single rebuild option. 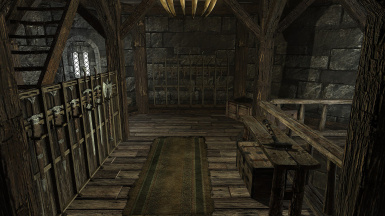 - Fixed a bug that caused the stable only being purchasable after purchasing another part of the castle. 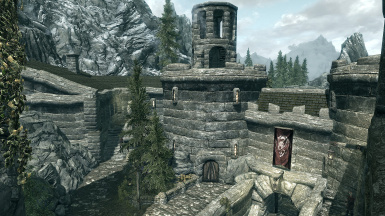 - Fixed a bug that caused the rebuild option for castle walls not being visible when the player has not enough money. - Fixed a bug that caused the Khajiit camp collide with a burned out wagon. - Fixed a bug that caused the lower door in the gatehouse not being enabled correctly. - Fixed a bug that caused weapons on weapon racks not being receivable. 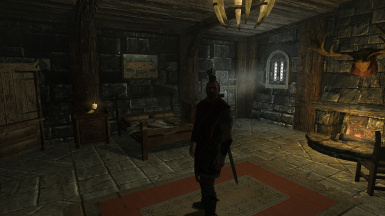 Improved shadow quality in interiors. There are a few 'dead ends' that allow you to walk out of the cell. These WIP areas seam to cause a lot of confusion, so I placed some rubble to close these 'holes'. 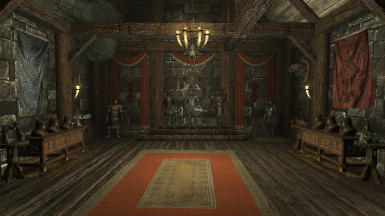 Added some missing guards in the throne hall to the script that changes the guards armor. 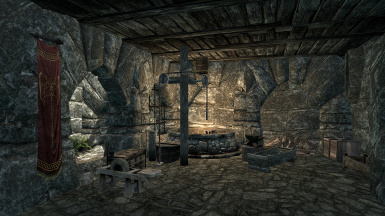 Replaced the portcullis with a static one that is always open. Renamed 'Reinforced Dood' to 'Reinforced Door'. 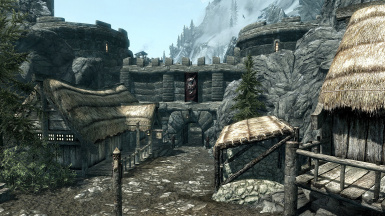 Renamed the 'Castle Riverwood Key' to 'Castle Gonduin Key'. 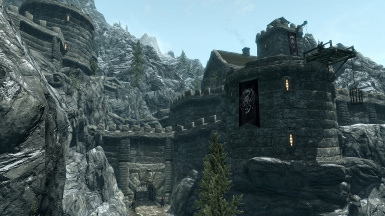 This mod adds a castle to the mountains southwest near Riverwood that can be used as player home. 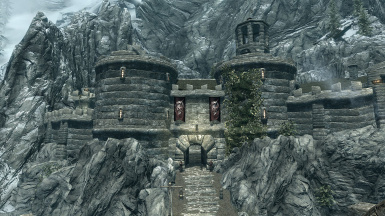 The castle is abandoned due to a curse that lays on it. 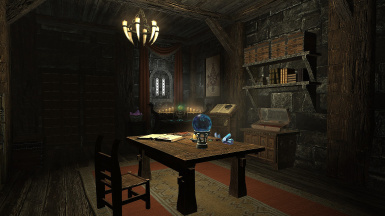 After completing a quest and lifting this curse you can rebuild it part by part and make it a comfortable home. To start the quest just wait for the courier. If you don't want to do a quest you can skip it then. Enjoy! 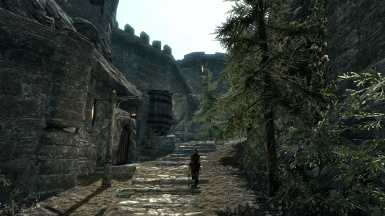 Skyrim Special Edition version can be downloaded here. You can customize the armor and weapon of every guard. Just talk to them and give them the equipment you want them to wear. Please note that you can only give one piece of armor per slot and only one weapon to them. If you give a guard a second weapon you will automatically get back the first one. Same goes for armor parts. 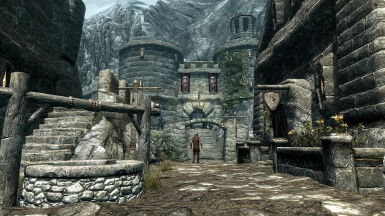 This mod comes with an optional quest, during which you have to lift a curse and rebuild the castle. If you don't want to do the quest, just choose the "Skip the quest" option after reading the letter from the courier. 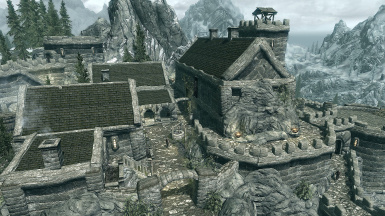 You can then use the fully upgraded castle as player home. Recommended level for the quest 20+. 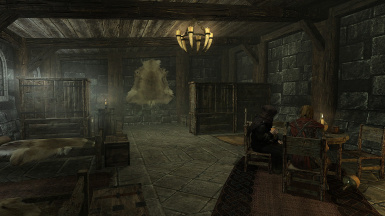 Whenever you are bored and want some action near your castle, just talk to one of the guards or blow the horn on top of the tavern tower to trigger an attack. The type of attack is random. 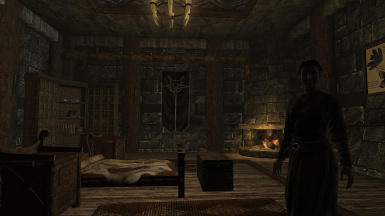 So there might be a dragon attacking one time and bandits or Imperials/Stormcloaks the other time. The direction of the attack is also random. A: Fix your load order. It does not crash on a fresh installation without any other mod. Q: The courier does not give me the letter. A: You can skip this step by using the console command: "setstage CastleGonduin_Curse 5". Q: Where is the steward? 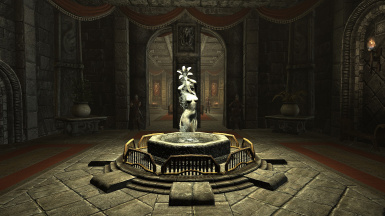 A: The steward is in the main hall of the castle. 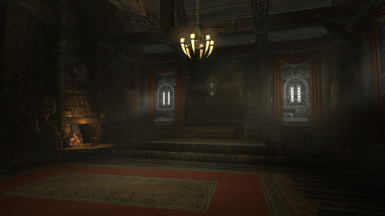 Q: The steward does not have any dialog options to rebuild the castle. A: Quicksave (f5) and reload (f9). He should have the dialog options now. Q: Will containers within the player home respawn? A: Neither the containers nor the cell itself will reset. 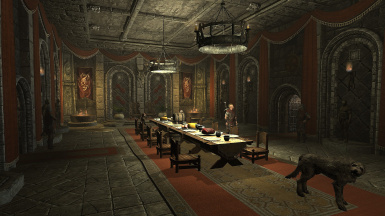 Other interiors like the tavern or the forge may reset though. Q: Can I move my childrin/family/9000 followers in? A: No. If you want that feature, add it yourself. Q: The wraith is to strong! It killed me with a single hit! A: "If they're too strong, then you're too weak." Q: Is this mod compatible with <insert random mod>? Q: Can you add this little feature: <insert random feature request>? 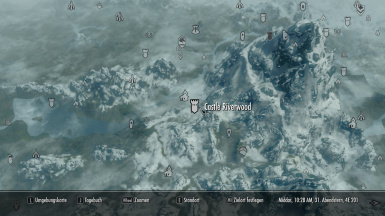 Q: I don't like Riverwood. 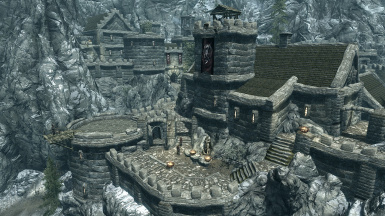 Can you move the castle to an other location? 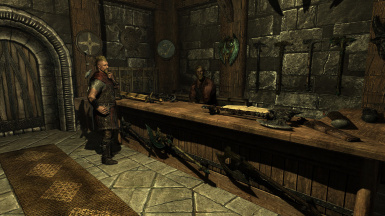 Q: I am a Stormcloak, but the letter says it comes from Jarl Balgruuf, who is dead?! A: Deal with it. I don't care about your precious immersion. 1. Download and extract the main file. 2. 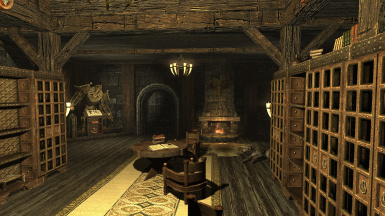 Copy contents to the Data folder of your Skyrim Special Edition installation. 3. Activate CastleGonduin.esp with your favorite mod manager.